1. Preheat oven to 375 degrees F (190 C). Grease a large cookie sheet; set aside. 2). In a large mixing bowl beat butter with an electric mixer on medium speed for 30 seconds. Add sugar, cocoa powder, and baking powder; beat until combined. Beat in eggs. Beat in as much flour as you can. Stir in any remaining flour. Stir in the chopped 4 ounces white baking chocolate and the chopped 3 ounces semisweet chocolate. 3. Divide dough in half. Shape each half into a 9-inch-long roll. Place rolls 4 inches apart on prepared cookie sheet; flatten rolls slightly to 2 inches wide. 4. Bake in a 375 degree F (190 C) oven for 20 to 25 minutes or until a wooden toothpick inserted near the centers comes out clean. Cool on cookie sheet on a wire rack for 1 hour. Using a serrated knife, cut each roll diagonally into 1/2-inch-thick slices. Lay slice, one cut side down, on an ungreased cookie sheet. 5. Bake slices in a 325 degree F (160 C) oven for 8 minutes. Turn slices over and bake 7 to 9 minutes more or until slices are dry and crisp. (Do not overbake.) Transfer to a wire rack; cool. 6. If desired, in a heavy small saucepan combine the shortening and the coarsely chopped 2 ounces semisweet chocolate or white baking chocolate. Cook and stir over low heat until melted and smooth. 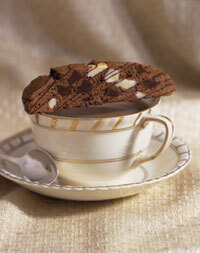 Drizzle over tops of biscotti. Let stand until set. Store in an airtight container up to 1 week.